The best all-season performance diesel fuel additive, DIESEL AID enhances all-around performance and helps you avoid expensive breakdowns. 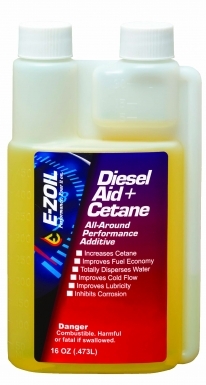 The best all-around diesel fuel performance additive, DIESEL AID + CETANE protects critical fuel system parts while improving power. The best warm weather demulsifier diesel fuel additive, DIESEL FIRE, enhances all-around performance and helps you avoid expensive breakdowns. The best fuel storage performance additive, STORZALL uses an anti-oxidant formula to inhibit fuel oxidation, protecting your fuel system and engine components and helping prevent breakdowns. The best all-around diesel fuel system cleaner, CARBON CRUSHER, reduces fuel costs by cleaning the entire fuel system from top to bottom.